Ditch Witch®, a Charles Machine Works Company, has partnered with Utilicor Technologies, Inc. to bring the benefits of advanced keyhole technology and reinstatement to contractors, municipalities and utilities globally. Due to the partnership, utility contractors will now be able to operate a nimble, construction-grade Ditch Witch mini skid steer fitted with the new Utilicor MTC100 coring attachment to perform repairs, without rerouting traffic or exposing large areas of open excavation. 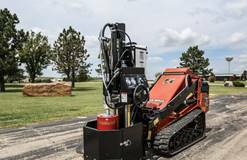 The MTC100 was developed in partnership with Utilicor as the first product entry into the coring market for the Ditch Witch organization. Designed to work exclusively with the SK-line of mini skid steer units (the SK800, SK1050 and SK1550), the MTC100 can quickly and accurately cut up to an 18-in diameter hole and 22-in depth, minimizing surface disruption. Vacuum systems are then used to excavate down to the utility for maintenance that can be performed from the road surface using special long-handled tools. Once the underground work has been completed, the original core is bonded back into the pavement as a permanent pavement repair for minimal surface disruption – no patching or repaving required. Coring techniques offer significant cost and time savings. Today, keyhole coring technologies are approximately 50 percent less costly than traditional excavation repairs and disposal removal. And, roads can be reopened to traffic within 30 minutes of repair completion. As part of the companies’ ongoing partnership, Utilicor products are now available through the Ditch Witch global dealership network. To find a participating dealer near you, visit http://www.ditchwitch.com/find-a-dealer.